Twitter has a feature called Who to follow that suggests other users you might be interested in. I haven’t paid it much attention yet, but I’m interested in the fact that the phrase is censured by people who think it should be Whom to follow. There’s even a Chrome extension that “corrects” it. Did I say even? I should have saved that for the Grand Order of the Whomic Empire, which solicits “moral support for those people who work tirelessly to bring whom back into everyday circulation”. I fear their quest is not entirely tongue-in-cheek. Anyway: Who to follow. Let’s see what its critics say. Does it bother anyone else that Twitter lists follow suggestions under "Who to follow," rather than "Whom"? Twitter, I won't use "Who to follow" until you correct the grammar ("whom"). Geez, folks, this is a blight on your UI. Many, many people take the time to tell Twitter what it “is” or “should be”. Some are pretty funny about it. Can I just say it's not "Who To Follow," it's "WHOM to follow"! Yikes. Our precious language is crumbling and no one seems to care. I do. hey @twitter, it's Whom To Follow not Who To Follow, unless you're trying to be "street"
Dear Twitter web page, the dashboard component title should be "Whom to follow" not "Who to follow". Ditto for the API. Sorry about that. Twitter: it's "whom to follow" not "who to follow." You obviously don't care but I do – so I said it. Many have asked if Twitter's "Who to follow" should be "Whom to follow." It should, but I think even I am losing the will to defend "whom." Maybe you agree with these critics; maybe you’re unsure. There is a traditional rule, which arose in the 18th century, stipulating whom as the object pronoun. But in many contexts — Twitter’s Who to follow among them — who is also grammatically fine. Not only that: it sounds natural and normal, whereas whom in the same context runs the risk of sounding fussy, affected, and pretentious. Who’s detractors overlook the importance of register. Register in linguistics and stylistics refers to the type of language used in a particular social scenario or field of discourse, often with regard to the degree of formality. Think of the difference between “How do you do?” and “How’s tricks?” and the many varieties in between. We shift our register to suit the listener, the topic, and the situation. It’s a question of communicating in a manner appropriate to the circumstances, and we tend to do this instinctively and automatically. At Language Log, Arnold Zwicky says there are now two standard systems for using who(ever) and whom(ever): an older system “prescribed (often sternly) by many authorities”, in which whom(ever) is used whenever the pronoun “serves in the syntactic function of OBJECT (of a verb or preposition)”; and a more recent system with who(ever) as the default and whom(ever) used “only with fronted prepositions (to whom)”. Zwicky says many speakers use both systems, depending on “formality, emphasis, prosody, and the like.” He also addresses this at the Visual Thesaurus. Incidentally, whomever doesn’t occur at all in some idiolects, but, for the record, it’s not “a made-up word used to trick students”, as Creed says in The Office; this is analysed at Literal-Minded. Joseph M. Williams, in Style, categorises whom-observance as an optional rule and calls it a “flag of conscious correctness”. Geoffrey Pullum concurs in a recent post at Lingua Franca, distinguishing between Normal and Formal styles and identifying whom as a “classic marker” of elevated style in standard English. Whom is unnecessary — indeed, it’s out of place — where a conversational tone is sought. Note: this already-long post is about to get longer. And nerdier. I’ve made my main point and intend to explore it further with quotations from usage authorities, and to assess whether whom is doomed. So skip ahead or flee now if you like. There are graphs further down, and there’s a summary at the bottom. There’s also a video and some hypercorrection to liven things up. A few language authorities present the rules on who vs. whom and say little or nothing about tone or context, as if the formal register were all anyone needed. Many others, however, adopt a more nuanced and realistic position, acknowledging that whom is best suited to formal writing, is usually ignored in speech, and can often be dispensed with in less formal writing. There is a fair amount of consensus on this. As a rough guide as to which word to use, substitute he or him for the who or whom and see which makes sense. But we should follow common usage and be ready to use who as the object where this sounds and looks more natural, e.g. Who she met at the midnight rendezvous was not yet known. The Elements of Style sets forth the rules and nothing more. The traditional rules also constitute treatments by Grammarly, English Plus, Write.com, grammarErrors.com, Grammar Girl (and here and here), and myriad style and writing guides, online and off. But it wasn’t a mistake, and the rule didn’t exist until many years after Shakespeare was alive. Don’t be deceived that there’s a “simple rule” you either obey or spurn: the terrain of whom’s usage is more involved than that. John E. McIntyre (who finds that whom can sound “stilted, fussy, or pompous”), says even educated writers have trouble with who/whom, and that as a general guideline “you can, except in the most formal circumstances, just use who”. Geoffrey Pullum describes the situation as “multi-layered, subtle, and devilishly complex”. first, there’s a decided tendency to use who colloquially in most contexts; second, among those insecure about their grammar, there’s a tendency to overcorrect and use whom when who would be correct. Writers and editors of formal prose often resist the first of these; everyone should resist the second. The second tendency, a phenomenon called hypercorrection, recurs in much of the commentary on whom. Hypercorrection happens when a grammatical rule (real or otherwise) is inappropriately extended by mistaken analogy, often in an attempt to sound more correct or proper: adding -ly to the adverb doubtless, for example, or pluralising ignoramus as ignorami. Language Log has examples with whom, or see my post “Whom’s Law of Hypercorrection“. Writers are often unsure of the right case in subordinate clauses, e.g., a candidate who(m) we feel is ideal. The rules dictate who, because the case is nominative (who is ideal), but nominative whom can be found in the English of Churchill, Dickens, E.M. Forster, Somerset Maugham, and Shakespeare. The Merriam-Webster Dictionary of English Usage says it’s possible “that subject whom need not be hypercorrect”, citing a long defence by Otto Jespersen. Because the prescriptive rules are so widely shared (though only patchily grasped), you might be surprised to hear that who and whom have been used interchangeably since the 14th century. The system governing their use was created by grammarians in the 18th century who decried loose and variable usage. But as Ernest Gowers wrote in The Complete Plain Words, “good writers have for centuries been perverse in refusing to do what the grammarians tell them”. And not just good writers, but all language users, whose tongues will largely do as the occasion — not the grammarian — demands. well established as part of formal Standard English. Nonetheless, whom is uncommon in speech and informal writing because of its inherently formal tone. When formality is not required, who generally replaces whom. Sentences such as It was better when he knew who to pay attention to and who to ignore sound perfectly natural, despite violating the traditional rules. If you’re wondering just how uncommon whom is in speech, Mark Liberman has numbers. AHD5 also remarks that in many contexts whom sounds “forced or pretentiously correct”. does not appear to be markedly different from the usage of Shakespeare’s time. But the 18th century grammarians, propounding rules and analogies, rejecting other rules and analogies, and usually justifying both with appeals to Latin or Greek, have intervened between us and Shakespeare. It seems clear that the grammarians’ rules have had little effect on the traditional uses. One thing they have accomplished is to encourage hypercorrect uses of whom. Another is that they have made some people unsure of themselves . . .
objective who and nominative whom are much less commonly met in print than nominative who and objective whom. In speech, you rarely need to worry about either one. In writing, however, you may choose to be a bit more punctilious, unless you are writing loose and easy, speechlike prose. English has long given us Conversational, Informal, Semiformal, and occasionally even Formal uses where, at the beginnings of clauses where whom is called for, who occurs instead. . . . the closer a preposition is to its object pronoun, the more likely we are to use objective case: Who did you go with? but With whom did you go? This probably rings true for most people. I know if I were aiming for a more formal version of The person I wrote to, I would front the preposition and say The person to whom I wrote, never *The person to who I wrote, which just sounds wonky. Every sensible English speaker on both sides of the Atlantic says Who were you talking to? and the sooner we begin to write it the better. Whom is a relic of the bad old days when inflections were cherished for their own sake . . .
R.L. Trask took a similarly blunt line, claiming in Mind the Gaffe that most people find whom “utterly mysterious”, and that the journalist who said George Bush’s slogan Who do you trust? should be Whom do you trust? “must have spent several generations living in a cave”. Both quips are a bit extreme, but you can see what he means. So. Does the bell toll for whom? If native speakers of a language — including many people who obviously read and write just fine — need schooling to learn a feature of their native grammar, that feature of the grammar is on artificial life support. Corpus graphs show a clear decrease over time, and an interesting breakdown by genre. You can click through the following images for more information. In conversation, who appears to have supplanted whom, almost universally. There is no going back. In formal writing, such as an academic paper or book, whom remains on its precarious perch. In middle-level discourse, such as journalism, which aims at a conversational tone while adhering to the conventions of standard written English, whom is slowly slipping away, and probably should. Who and whom have been used interchangeably since the 1300s. The rules arose in the 18th century, and appear to have had only limited effect on usage. In many formal contexts, replacing whom with who as the object pronoun will elicit frowns and criticism. The more formal the context, the more whom is expected to appear where the traditional rules ordain. You should aim to understand the rules if your house style includes them, or if your intended audience is academic or very formal. In less formal contexts, things are generally more relaxed. Some publications uphold the traditional rules as much as possible; others don’t. Certain syntactical arrangements call strongly for whom, such as right after a preposition: to whom it may concern. In casual language whom is rare, and probably getting rarer. If in doubt, trust your ear. If that doesn’t work, default to who. You can use whom as you see fit, but you’ve no business telling people they should use whom in conversational English. This is the tone used in Twitter’s phrase Who to follow. There’s absolutely nothing wrong with it. Your thoughts would be welcome, here or on Twitter. It’s hard to say anything new about “whom”, but it does raise a broader question: how to think about these questions. . . . The middle option [e.g., Reuters’ advice] always seems like a sensible one, but the objection is obvious: “who decides what’s natural?” Are you just fine with such a rough rule? Or do you crave a framework that doesn’t require on-the-fly judgment? Colleagues, literate, educated, adult native speakers making a living with words, regularly come up to me to ask, “Should this be who or whom in this sentence?” They’re not barbarous. . . . They just don’t hear it. They don’t know whether to use the pronoun as subject or object unless they pause to parse the sentence. And that’s in ordinary, journalistic sentences, not rococo Nabokovian constructions. Even when they do try to work it out, they commonly get it wrong. In Whom to (V), Arnold Zwicky analyses the grammar of Twitter’s “Who to follow” (he agrees with my conclusion) and of a related phrase, “whom to believe”, which he finds “Not unacceptable, but very much not what I would say or write.” He links to several other edifying posts on the subject. A clear and commonsense summary of who vs. whom by Michael Rundell at Macmillan Dictionary Blog. Megan Garber at the Atlantic provides a brief account of whom‘s apparent “inexorable decline”, quoting from this post and remarking that the word “costs language users more than it benefits them”. I’ve written a little more about this at Macmillan Dictionary Blog, of particular interest to anyone concerned or alarmed by the decline of whom. The Sentence first archive has more on whom, including its hypercorrect use. This entry was posted on Thursday, April 5th, 2012 at 3:38 pm and is filed under editing, grammar, journalism, language, linguistics, usage, words, writing. You can follow any responses to this entry through the RSS 2.0 feed. You can leave a response, or trackback from your own site. ‘Whom’ comes to us from ‘hwam’, the dative case of Old English ‘hwa’, which meant ‘who?’ or ‘anyone’, someone’. It wasn’t used as a relative pronoun. The accusative masculine and feminine form was ‘hwone’, and the accusative neuter was ‘hwæt’, so those who wish to roll back the tide of language should really be arguing for either ‘whon’ or ‘what’ rather than ‘whom’. 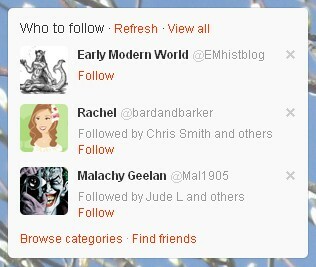 Anyway, ‘Who to follow’ strikes me as shorthand for something, and I’m not absolutely sure what! I’ve been waging a personal war against all those tweeps who have incorrectly accused Twitter of a grammatical faux pas and I certainly hope Twitter won’t change it. I wrote a post, not as detailed as yours, obviously, nor do I carry the same weight as you: http://aclil2climb.blogspot.com.es/2011/10/when-to-use-who-or-whom.html. Every time they tweet, I replied and tell them off (nicely, of course). Most don’t even acknowledge. But the war rages on and they’re still tweeting about it. One thing I’m sure of, Stan, is that 99%, if not 100%, of all those moaning about its incorrectness are US English speakers. Chiew confirms my suspicion that objections to such usage are largely American. American English seems to be much more rule-driven than our variety. Does this reveal a wish to be more royalist than the king, I wonder? I’m having so much fun with all that. Thanks, Stan! I have put your amusing post on Facebook for my Tweeting friends. Let me confess that my heart goes for the classy owl. Maybe because I feel so smart and knowledgeable when I say “whom” at the right place, to the right person, at the right time. I would hate to say goodbye to it all! Barrie: It certainly does: being able to get this sort of minutiae “right” substitutes for actual status among the nerve-wracked bourgeoisie. What Language Log calls “Anxious Cluelessness” seems more prevalent in Am. than in Br.Eng, but perhaps that’s because we Americans haven’t gotten class, race, immigrant, economic, and local dialects sorted out, and are taught zero about the English language in schools. That’s if we’re lucky. If not — and most of us aren’t — we are taught some variant of the usual Catechism of Shibboleths (in which whom features prominently). This is normally ignored, except by the credulous. As for the status of whom itself, I’ve been on record for twenty years, at least, that it’s a Zombie word, like hast, forsooth, and Ye Olde, shambling around trying to get work in fake-formal sentences, like the ones here. When i was teaching ESL, I advised students never to use whom, since it never occurs except in a fixed phrase — and there you just memorize the phrase — or when it’s the object of an immediately preceding preposition, and that’s a construction that can always be avoided: — just use Who did you give it to? instead of To whom did you give it? Personally, I only use “whom” directly after a preposition, but not when stranding, which I do often – and I’m pretty sure it’s because I’m old and that’s how I learned it. I don’t blink at “from who” when I hear it – might even say it for all I know, really. It’s no more difficult to parse than “from you” or “from it” or “from any noun” after all. The choir to whom you are singing, are those who agree with you. I can’t help but think ‘whom’ is on the way out just like how ‘thou’ and ‘thee’ are now ‘you’ for both subject and object 2nd person pronouns. It’s interesting that who is, as far as I know, the only word aside from the personal pronouns that survived Middle English with any of its case forms intact. It’s no wonder it’s losing its oblique forms; it’s unique, and such grammatical wrinkles tend to get smoothed out over time. Thanks for a fascinating article. The MS Word loop was great fun, and it was very interesting to know that “whom” is not as nar to extinction as I had thought. I was delighted to read that it has been described as moribund, exactly the term I’ve been using of it myself for a decade or so now. In standard NZE, it’s definitely moribund, probably heard most frequently in the hypercorrection setting. Other that it, it’s like the extra-special fine china, only brought out to show off in front of the sort of people to whom that sort of thing matters. My concern with this essay is the unwritten subtext that we experts, the language professionals, the editing class, understand “whom” and use it correctly. We do not hypercorrect, and we do not use “whom” against the sense of the idiom. We’ve mastered it and execute it in prose beyond any accusation of fault. Kudos all ’round. The hoi polloi, alas, cannot be trusted with “whom,” pitiful rabble that they are, and so the official guidance here is that casual, ordinary persons should just forget all about “whom” because it’s really too difficult to handle. So ignoring it is A-OK. It’s a bygone relic and so march forth with “who” in all cases and don’t worry about us – we’ll just be laughing at you behind your back. So that’s my problem, Stan. We can’t have it both ways. Either we hold out the rule for use and champion it, or we advocate for its demise. Surely the sort of people who are tetrapyloctomously pedantic about the use of “whom” are the same sort of people who complain about the article reduncancy in “THE hoi polloi”? I ask merely for information. Yes, they are. Well observed! “Whom” would have sounded ridiculous. It’s a great little song, btw. Never mind about Lowell George, what about Bo Diddley? David L hints at a consideration that is consistently and annoyingly ignored by those who cite writers like Shakespeare regarding the usage of “who”/”whom”, which is that theatrical projection and elocution were of prime importance when they composed those lines. In that context especially, “whom” is a perceptively longer and rounder syllable than “who”, and in many cases is also more difficult to elide or unstress. P.S. I meant: theatrical as well as poetic considerations. Barrie: True. Anyone who tries to roll back the tide of language runs into inconsistency before they’ve even begun. Harry: Thanks for your thoughts on this. I too think whom has its place, but in everyday encounters there is seldom much need for it. I wonder if Matthew Parris notices his wayward whos! Jams: In many contexts, to many people, yes. Chiew: People tend to dislike being contradicted, especially if they’re sure of being right! Thanks for the link: your post is a helpful summary of the grammar, and I agree with your remark that it’s “a case of what comes out naturally”. Interesting observation about the geographical source of complaints. Many of the tweets and articles I saw, of which the above are but a selection, were from AmE speakers, but the sample size was too small to warrant any conclusions. Barrie; John C.: Whatever the reason, there appears to be a similarly US-centric preference for the that/which rule. Claude: I’m sure the owl will find a suitable partner with whom to hoot in a classy fashion! Being able to say whom “at the right place, to the right person, at the right time” is altogether admirable; to persist in saying it at the wrong place, to the wrong person or at the wrong time is what happens when the rule supersedes pragmatic sense. Thank you for sharing the post, by the way. It’s much appreciated. John L.: The advice you gave your students strikes me as very sensible, but I wouldn’t go so far as to categorise whom alongside hast, forsooth and Ye Olde. Not yet, anyway! It’s still in fairly common currency in writing, and unlike those zombie words it’s generally used without irony — although, as you point out, the constructions it appears in can always be rewritten, unless they’re fixed phrases. Karen: I’m a frequent strander too, so I don’t find much need for whom. It’s difficult to decide how often I use it, and in precisely what contexts. I think you’re right that pretentiousness sometimes explains hypercorrect whom, or it can be a question of insecurity: people in certain situations feeling anxious to use it “properly”. As for what motivates the fight for “the fading remnants of case marking on pronouns”, my old post on language correctness, corruption, and doom has a few suggestions. Charles: It does seem to be gradually slipping out of use, but not in all contexts. Very formal writing is likely to retain it for a long while yet, I think. Jonathon: That’s a good point. I hadn’t thought of it as a grammatical wrinkle before. stuartnz: Glad you enjoyed it. MS Word’s infinite loop made me laugh too! Whom as fine china is another good analogy. It may be fragile in everyday use, but boxed away in academic prose it should survive many more decades. Mededitor: Hmm. I don’t see how you inferred all that. Laughing at the “pitiful rabble” behind their back? I see nothing remotely suggestive of such a tone in what I’ve written or quoted. Nor do I see any need to decide once and for all between championing the rule or arguing for its dismissal. Different contexts call for different approaches. Someone editing a document, or creating or revising a style sheet, will need to decide one way or another — but there won’t be unanimity among language professionals, nor does there need to be. Stuart; languagehat: I’m staying out of the hoi polloi argument for now! David: Thanks for the song suggestion; I just listened to it. I don’t know if I’d find whom ridiculous there, but certainly it wouldn’t sound as good or as natural to me as who. Terry: A fine example, and a great song. Robert: That’s a very good point. I’m sorry if I annoyed you by not making it. Stan, you didn’t annoy me at all–you didn’t cite Shakespeare, merely those who did. My writing was a bit muddled, too. More clearly (I hope): The value of dramatic speech as support for grammatical “rules” is suspect because the playwright’s first considerations are the character’s speech patterns (correct or not) and the requirements of theatrical performance, and in some cases prosody. At best, it’s second-hand information about the way certain kinds of people spoke (or were thought to have spoken) in a certain era, distorted by artistic exigencies. I’m picking nits, perhaps, but I think no more so than who/whom partisans. Thanks for the great article and research! Well, after all, already Hemingway was aware of that for whom the bell tolls. Nothing new, still: Another interesting and amusing post, Stan, and your commenters add(ed) to it. Thank you. Hemingway was quoting John Donne. @ Barrie: Ha! Thanks for that. Unsatisfactorily educated Germans ought to be very careful when writing comments. Robert: Thanks again for your thoughtful and constructive contributions. It’s an aspect of historical usage to which I hadn’t given enough consideration. Sean: You’re very welcome. Discussions such as this one become immeasurably more interesting with comments, I find, otherwise it’s just me yakking on and quoting excessively! A number of years ago I followed a link to a grammar quiz in which the authors claimed they were not prescriptivists and that their answers were backed up with references to descriptive sources such as dictionaries. Which would have been nice if it were true. One of the questions was about whether “whoever” or “whomever” was appropriate in a given sentence. I naturally chose “whoever” because in my dialect, as in many others, no such word as “whomever” exists. The quiz writers, however, insisted on “whomever”. So far so ordinary. There are plenty of grammar quizzes where the author’s personal opinion is presented as objective truth (though I expect few of them claim a descriptivist philosophy). What was extraordinary in this case was the reference provided to back up their answer. It was a dictionary entry on who vs whom — and as such had nothing whatsoever to say about forms ending in -ever. The quiz writers simply assumed that “whoever” corresponds to “who” and “whomever” corresponds to “whom” in a regular fashion. Apparently it didn’t occur to them that this — and not the distinction between “who” and “whom” — was the more likely point of contention and needed to be defended (or better, abandoned). Adrian: That’s strange. It’s one thing to design a grammar quiz whose answers are of limited or questionable correctness (nothing new there), quite another that the quiz writers went to the trouble of providing references that turned out to be misleading. To assume that facts about usage could simply be extended from who(m) to who(m)ever is quite an amazing leap to make. Anyone else bothered by Twitter’s “who to follow”? That’s true, Barrie; whom is the exception rather than the rule in song lyrics, and Mercer’s is an interesting example given the position of the preposition. which relies whom for a closer rhyme. Thank you for the comment and link, Stephen. I think that people will continue, for the most part, to use whom when it comes naturally — and to forgo it when it doesn’t. to flesh-eating Dragon: i know it’s a different language from yours, but the OED describes ‘whomever’ simply as ‘ the objective case of WHOEVER’. Sean: Either whomever or whoever would work for me there. McGahern may have felt the latter would be a little too casual. I don’t agree that ‘who’ “sounds natural and normal, whereas whom in the same context runs the risk of sounding fussy, affected, and pretentious”. It sounds right to me, and avoiding its use (for fear of sounding pretentious) leads to dumbing down of our language. “To whom did you give the book?” “I gave the book to him.” You wouldn’t say “I gave the book to he.” “Who did that?” “He did that.” You wouldn’t say “Him did that.” So… whom > him and who > he. :) Níl sé deachair. Angie: No, it’s not hard, but it’s changing. English has dropped all sorts of inflections over the centuries, and none of these changes has ‘dumbed down’ the language. I think most people would strand the preposition in your example: “Who did you give the book to?” But I do say in the post that whom is holding out in that niche just after prepositions. It’s tiresomely pedantic or sloppy English. What if Twitter offered the choice in settings/preferences so we can all go home and have a nice hot dinner? Who to follow is not sloppy English – it’s normal informal English. But I’m all in favour of Twitter offering us the choice.